This is a fun read about four friends, each with their own personal motivations for wanting to start a party-planning business together. The chapters are written from the perspectives of each of the four girls on a rotating basis which makes for an easy read as well as a strong connection with the characters. Each chapter begins with either a to-do list, horoscope, word definition, or a recipe for a dish that you can cook with your daughters (S’more’s Cookie Bars! Homemade Pita Chips!). The book is filled with examples of the power of grit, refusal to fail, and growth mindset; something goes extremely wrong at every one of the girls’ parties. It’s up the four girls to persevere and find creative solutions to the problems which include natural disasters, frenemy sabotage, and a too-cool-for-school tweeting grandmother who maxes out the guest list. The girls’ refusal to give up in the face of adversity is a mark of true entrepreneurs. You’re Invited is a fun read in which the characters exemplify grit, determination, and a refusal to give up. 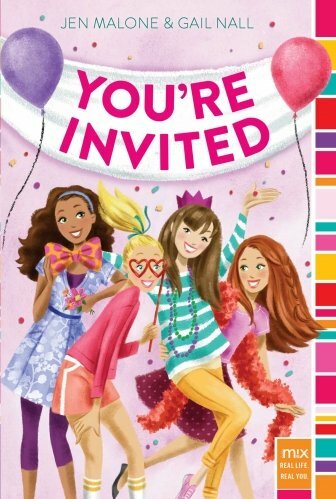 If your daughters enjoy this book, which I believe they will, there is a sequel: You’re Invited, Too. Benefits for customers: We handle all the planning, book the venue, get the cake and food, book entertainment, buy party favors, send out invitations, and clean up afterward. Tasks: Will be split evenly among all business owners. If someone can’t get something done she needs to tell the others right away. Cost: Depends on the party. Simple parties will cost less than extravagant parties. Cost will include cake, party favors, food, etc. and that part will be paid up front because we don’t have any money. Advertising: Get parents to make copies of flyers and put them up everywhere. Order free business cards online. Marketing and advertising are big themes in the second half of the book (making flyers and passing them out at a parade, giving out food samples, taking out an ad in the local paper, telling people about their business face to face, cold-calling) and the book concludes with a great example of the power of word of mouth. Other business topics touched upon include employee recognition, motivation, responsibility, branding, financial planning, brainstorming, work-life balance, and teamwork. One of the keys to success is grit – but to learn grit you have to learn how to get back up after you fail. Once a week, ask your daughter about a recent mistake she made or something she attempted but failed. Congratulate her on the mistake or failing (that means she was pushing herself!) and ask her what she would do differently next time. Importantly, tell her about a mistake you made so she sees that you also fail and learn from your failures. Share a story with her about something you tried and failed many times before you succeeded. If your daughter expresses frustration about the way something works (or the way it doesn’t! ), ask her how she would make it better and encourage her to try and do so. When you are in a retail store with her, ask her to consider how the store is organized. What she would do differently if it were her store? Would she change the location of certain products? Eliminate or add different products? Add or change the signage? The point is to encourage her to look at the world differently versus taking what’s in front of her as a given. 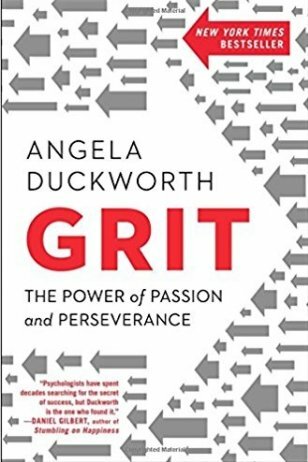 My favorite book for adults that parallels the never-give-up theme of this book is Grit by psychologist Angela Duckworth who explains that the secret to outstanding achievement is not talent but a special blend of passion and persistence she calls “grit.” We all have limits—not just in talent but in opportunity. But more often than we think, our limits are self-imposed. We try, fail, and conclude we’ve bumped our heads against the ceiling of possibility. To be gritty is to keep putting one foot in front of the other. To be gritty is to hold fast to an interesting and purposeful goal. To be gritty is to fall down seven times, and rise eight. The lessons in Grit are applicable to parents, children, and especially entrepreneurs of all ages.